A charred body has been removed from the location where Christopher Dorner may have spent his last moments on Earth. At this time, authorities have not positively identified the remains as those of Chris Dorner though the LAPD has stated, of the remains, “is the body of Christopher Dorner”. A Boy Scout leader carjacked by Christopher Dorner seconds before the ‘killer cop’ opened deadly fire on officers and barricaded himself in a cabin has revealed the terrifying moments with the man who shot dead four people and wounded three others. Rick Heltebrake said Christopher Dorner carjacked him at gunpoint near Big Bear Lake, California, on Tuesday afternoon. Ten seconds later, Heltebrake said he heard guns shot as Dorner engaged police officers in a raging firefight. 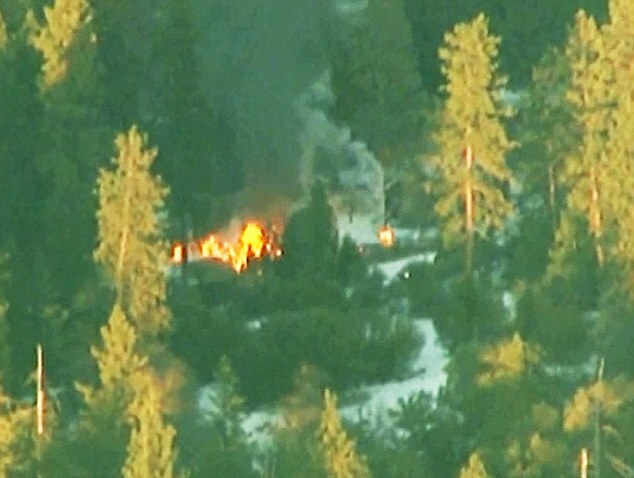 Dorner is believed dead after a charred body was found in the remote cabin where he barricaded himself and held officers at bay for about two hours. The cabin caught fire and burned to the ground in the midst of the standoff. Forensic tests will confirm the identity of the man found inside.